Gerrymandering metrics: How to measure? What’s the baseline? Bulletin of the American Academy for Arts and Sciences, Winter 2018. We explore some of the mathematical properties of the efficiency gap in light of the fact that it reduces to a straight proportional comparison of votes to seats. Notices of the American Mathematical Society, October 2017. A Jupyter notebook studying the relationship between Black voting-age population (BVAP) and patterns of current Black congressional representation. 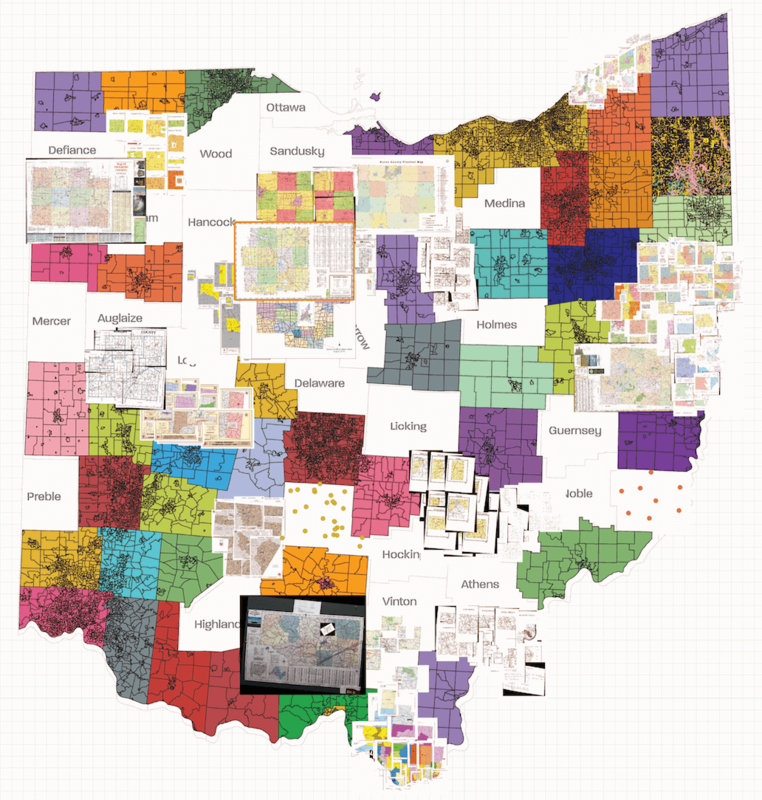 We contacted all 88 counties in Ohio and collected information about the locations of voting precincts, then digitized them and produced a publicly available shapefile—the first ever for the state. One of the reasons that redistricting is hard to study is that the space of possibilities is so huge it's unthinkable by humans. As a simplified warmup problem, we can ask: how many ways can you district a small grid? An interactive overview of the combinatorics of redistricting and the principles of Markov chain Monte Carlo (MCMC). 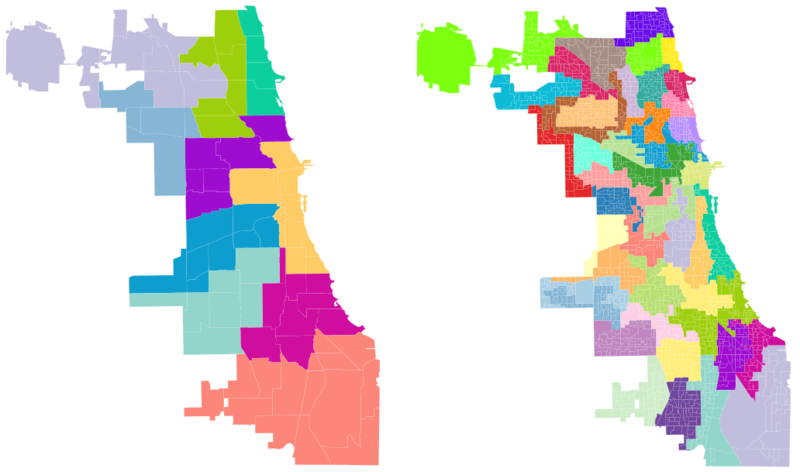 Our open-source Python library for sampling ensembles of districting plans using MCMC. Developed by Mary Barker, Robert Dougherty-Bliss, Daryl DeFord, Max Hully, Anthony Pizzimenti and Preston Ward during the 2018 Voting Rights Data Institute. Ecological inference (EI) is the main statistical technique used to establish racially polarized voting (RPV). A team at the 2018 Voting Rights Data Institute created R Shiny apps making it possible for anyone to run an ecological inference analysis. RxC tool, for more groups and candidates. At the time of writing, Virginia is in the process of replacing its House of Delegates districting plan after eleven of the districts were ruled unconstitutional by a District Court in June 2018. This report presents a large ensemble of alternative valid districting plans, which we propose to use as a baseline for comparison in the evaluation of newly proposed plans. Our method highlights and quantifies the dilutive effects of packing Black Voting Age Population. This is a novel application to racial gerrymandering of industry-standard techniques from statistics and computational science. An MGGG white paper on recommended remedies for a challenged at-large City Council voting scheme. We argue that the underperformance of Republicans in Massachusetts is not attributable to gerrymandering, nor to the failure of Republicans to field House candidates, but is a structural mathematical feature of the distribution of votes. For several of the elections studied here, there are more ways of building a valid districting plan than there are particles in the galaxy, and every one of them will produce a 9-0 Democratic delegation. An investigation of multi-scale compactness scores. An overview of problems with "compactness" and a call for research on discrete scores. Sensitivity analysis of compactness scores. A pure math riff on an idea for gerrymandering: can we use Ricci curvature to detect natural clusters in the dual graphs of states and other jurisdictions?